Are we nothing more than the sum of our office supplies? Is our worth as sentient entities limited to the cost of our pens, staplers and mailing supplies? Because I choose to spend my money on something other than a pen that writes in space, am I not as deserving of your respect? This is the question you must ask when choosing between the Federated Box Mfg. Co. #248 ValuBox™ 24″x24″x24″ Die-Cut Corrugated Cardboard Mailing Box and its gaudier, more shallow competitors. And by shallow, I mean actually shallow. For 83 cents more, Mailing Concepts Inc. will only sell you a 24″x24″x20″ cardboard box. It’s not vanity that should make one want the bigger box, it’s a simple value for the dollar consideration. Size aside, how does the humble Federated box compete against Mailing Concepts’ so-called “Rolls Royce of medium-sized retail shipping products”? For starters, the Federated box lacks the CornerSure™ corner flaps, those little pieces of built-in packaging tape that keep out dust, diesel fumes, bedbugs and anything else that might get at what’s in the box while it’s in the mail. If you think you are really too good to apply your own tape if you want some extra protection from the elements, you might as well just stop what you’re doing right now and go to the casting call for The Real Housewives of That City or State You Don’t Like, because you’re just that vapid and egotistical. Is manual labor beneath buyers of Mailing Concepts products? They seem to think so. Sure, the Federated box doesn’t have a garish red stripe running across its midsection. It does not have “To:” and “From:” already printed on. But if we squander our money on decorating something that we will only collapse into flat form before leaving out for recycling, we are squandering a piece of ourselves. Ladies and gentlemen of the retail box market, derive your pride from the life you lead, not the boxes you send. Cthulhu needs to make a cameo at some point now that he has his own eldritch fuzzball. i don’t know what is better. the reviews or the actual comic itself. i think i’m going to settle for both! I love that the Chicken listens to Skynyrd. It is too great. My job involves reading, sorting and checking thousands of product reviews for various companies. Otto’s review gets a gold star for being both helpful and fun. Funny thing about this manifesto is that squishables come in a 12x12x12 box. This is more interesting considering they’re 15 inches in diameter. They come out of the box in a somewhat crunched cube, and gradually fluff out to full size in an hour or so. I love these…. can’t wait for the next one!!! @zodo: He had luggage, thus the bigger box. why is the mail man so buff? My octopus came to me upside down and legs kind of bunched up all together like a young (but fat) palm tree). It looked pretty disgruntled despite the cute smile. I thought the labels on the mail transports were funny: Mail, Still The Mail, More of The Mail! And Breakfast is such a clever name for this chicken! So-wait, JUST SUPER ADORABLE!Aso squishy.Teeheehee. Does no one get it? 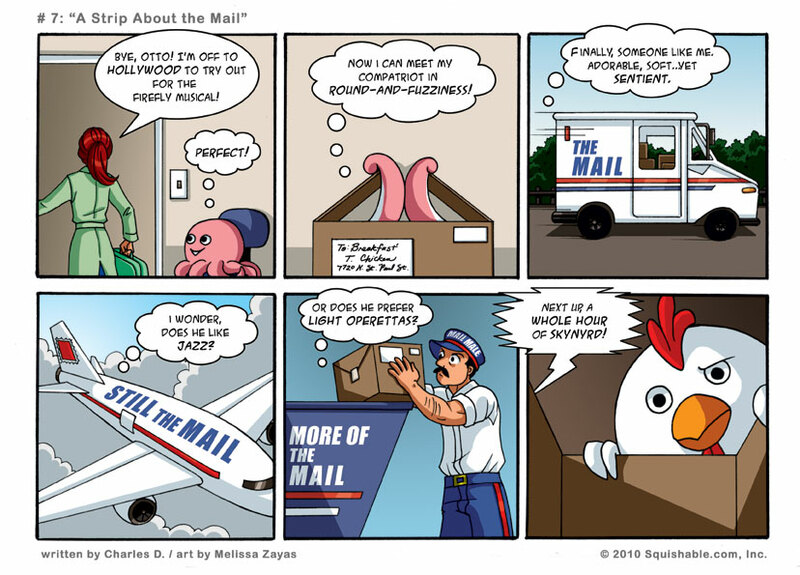 The mail man is buff because otto asks if breakfast likes “Light operettas” as in Light operators. I think operettas is just making the fact his hat reads mail male funnier? OCTOPI DO NOT HAVE MOUTHS. THEY HAVE BEAKS UNDER THEIR RING OF TENTACLES. PLEASE STOP PUTTING PEOPLE FACES ON CEPHALOPODS AND STOP MISLEADING PEOPLE IN THIS WAY.